With so many Beets harvested this year (this was a small portion of the total), we needed a few strategies for preparing and preserving them. Last year, we decided to try growing beets in the garden, and this year, we decided to add even more! 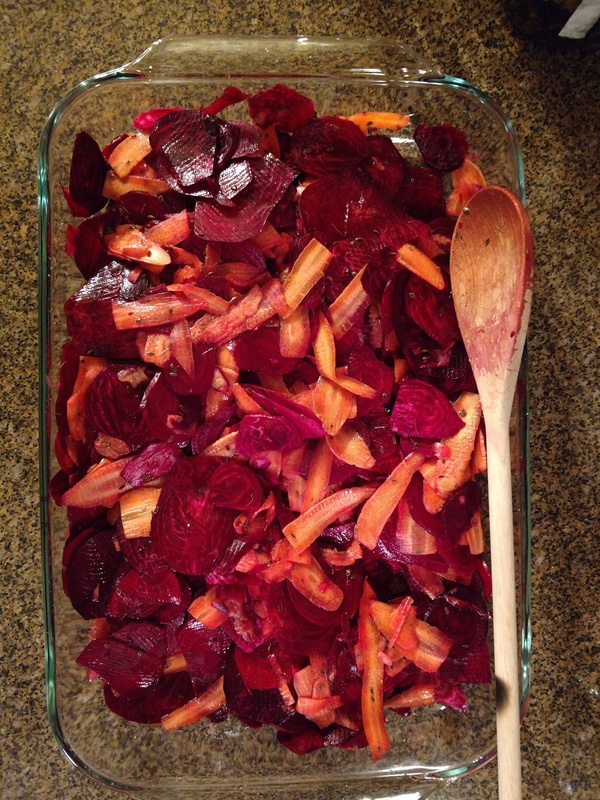 Two ways that we are preparing and storing the beets; dehydrated, and fermented. Beets have a lot of sugar and fermentation reduces that sugar and preserves nutrients at the same time. First, slice or shred the beet roots, then dehydrate on low heat until papery dry but still flexible—or set up a fermentation process similar to what is used to make sour kraut from cabbage. we created a mix of beet root and carrots for the fermentation. The mix consisted of about 35% carrots and about 65% beet roots. We used the same fermentation recipe as that which we use for sauerkraut; 11.5 to 12 grams of kosher salt per 454 g (1 pound) of veggies (purchase a small scale that measures both ounces and grams) plus 1 tablespoon of dill seed (also home grown). Mix all ingredients in a glass dish and let set for about 15 minutes. Then mix again and add to a crock pot, press down to minimize air bubbles, add fermentation weights, and cover for about 2 days (much shorter time than with sour kraut), then place the mix into jars, and refrigerate until consumed. There is no heating involved, so nutrient retention is maximized. Beet stems and leaves are also both edible and nutritious. Use leaves in salads, and use stems can be eaten with dip (like celery), stir-fried, or eaten plain. Both parts will remain fresh in the refrigerator for a couple of weeks. Interestingly, the stems have nutrition very close to the beet root, but the stems lack the sugar content. All parts of the beet—stems, leaves, and roots—dehydrate very well. I usually cut the stems into segments about ¼ to ½ inch long (about 0.7 to 1.3 cm) and then place in a dehydrator using low heat (about 90 to 95 degrees Fahrenheit) until papery dry on the outside with some flexibility remaining; leaves take less time, roots take more time. Dehydrated veggies and herbs can be stored in canning jars—in my experience—for at least 3 years, unless mold develops due to moisture presence and insufficient dryness (this is trial and error experience, but I have not seen any mold on dried produce so far). One way to help reduce moisture is to use desiccation packets—like those found in vitamin bottles—purchased online or check at your local health food store. Dehydrated veggies can be added to soups, stews, or chilies and other meat and sauce dishes. 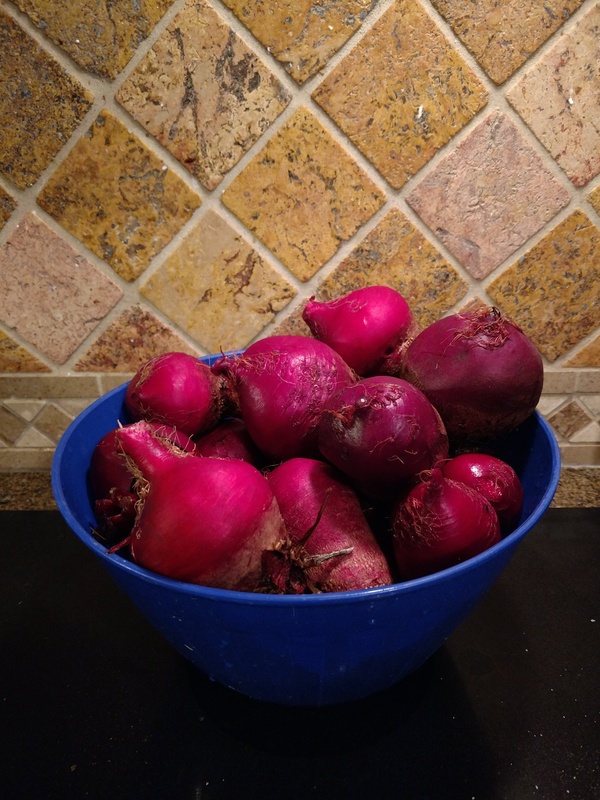 The fermented beets can also be dehydrated to add to those same kinds of cooked dishes – but remember to reduce or eliminate salt (at least until you have a chance to see if there is enough or not enough salt to your taste) because the salt from fermentation will be added to the food dish as well as the fermented veggies. ← Gladiolas for Cut Flowers!